In most of the country, spring is finally upon us. It feels like this winter has lasted for years! As the weather warms up, it’s time to start planning some fun activities for the summer. I absolutely adore taking my family on camping vacations. The great thing about camping is that you can hang out at the lake or in a national park for a weekend, and it’s super inexpensive. 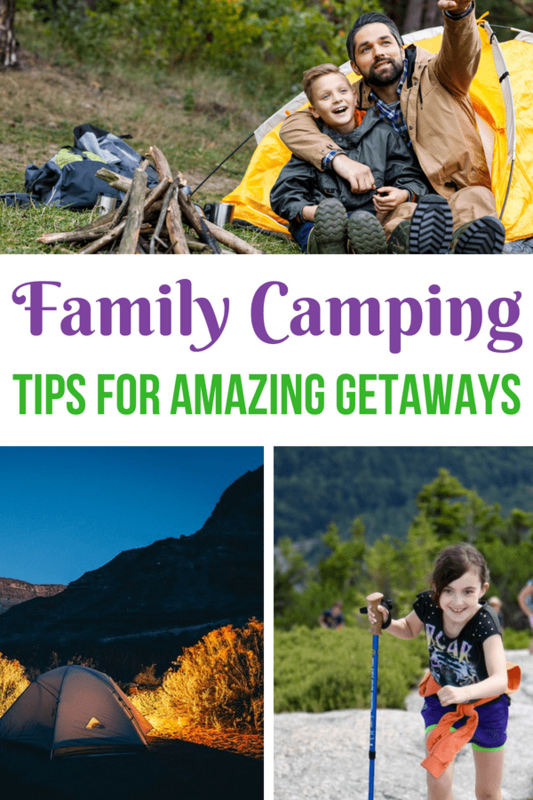 I’ve got some tips for planning an amazing family camping getaway. Avoid the popular holiday weekends if you can. Many families have a tradition of camping over long summer holiday weekends. This leads to crowded camp grounds and late, noisy evenings. It kind of defeats the purpose of having a camping getaway if you are up until the wee hours of the morning because you have active campers on all sides of your tent. You will save time and money if you pack your food in and cook at your camp site. Depending on the fire weather conditions in your area, you may be limited to using a propane camp stove. You don’t need to spend a ton of money to get a good camp stove. We love this Coleman Classic Camp Stove. The two burners mean we aren’t limited to one pot dishes. Most modern coolers can hold ice for about three days. We use this one, also from Coleman, for weekend trips. If you go on frequent, longer camping trips, you may want to upgrade to something like this RTIC cooler that holds ice for ten days. However, if you only take weekend trips plus one longer camping trip per year, it’s cheaper to go with the Coleman and restock your cooler mid-week. From experience I can tell you that you should get a tent big enough for all of your family members, plus one or two. This helps to keep people from stepping on toes or elbowing their neighbor in their sleep. Multi-room tents are great if you have teens that want a little privacy or if you need to keep a younger kiddo contained. Spend a little extra and get a waterproof tent. While you can check out all the weather predictions, they are only predictions. It’s no fun to wake up cold and wet because the tent wasn’t waterproof. Part of the reason for getting away on the weekends is to actually get away. If you are spending all of your time hitting every museum and tourist attraction for 100 miles, you won’t have any time left to sit around, tell stories, laugh, and connect with your family. The thing that makes camping so great is that you’re hanging out with friends and family rather than focusing on things to do. Spending time together becomes the experience. This helps for several reasons. First, you may need to take special precautions, such as a bear canister, to protect your food. Next, if you know that deer move through an adjacent meadow every evening, you can plan to find a hidden spot to watch them move through. If you’re camping in a national or state park, you can call a park ranger to see what the animal life is like near your camping spot. First time campers often forget that there will be a lot of trash to carry out. Food scraps should be taken to the nearest predator-proof dumpster, and the rest of your trash needs to be secured in bags so that it doesn’t blow away. Each year, more than 100 million pounds of trash is left behind in national parks including Denali, Yosemite, and Grand Teton. Packing out your trash helps to preserve our national parks for other visitors. Bring several smaller trash bags with you. For most families, this goes back to how far you have to hike from your car to the camping spot. If you’re doing backcountry camping, packing cots in is just extra weight. If you’re camping at a local lake and your car is three minutes away, carrying cots is not a huge deal. They can make your camping weekend a little more comfortable. Try to go somewhere new. While taking a weekend excursion, you probably want to stay near home. But whenever possible, try to find a new campsite to check out. This gives you new hikes, an unexplored region to check out, and the chance to meet new friends. While you should take a cell phone along in case of emergency, make your camping weekend a chance to stay away from social media. Take great pictures, but wait until you’re home to upload them to Facebook. Trust me, they can wait. 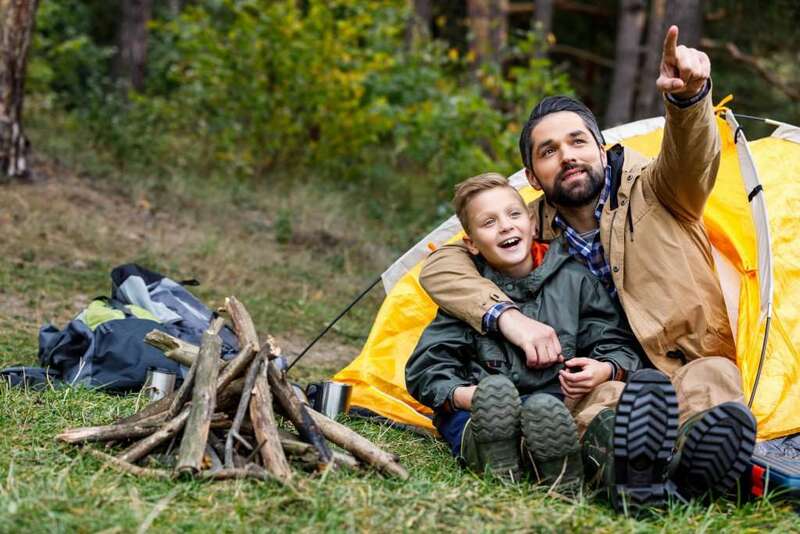 Camping is a great way to have inexpensive fun with your family. In most places, you can hit a campsite often, so take advantage of those warm summer months to plan some fun family adventures!